Made in Russia's Republic of Tatarstan, the Mi-14 is preparing a return to the Russian Navy. The Mil Mi-14 is a shore-based amphibious helicopter armed for the armed forces has options: a torpedo, twelve 64kg or eight 120kg depth bombs. This submarine killer also had very special ammo in its arsenal: a 1 kiloton nuclear antisubmarine bomb weighting 1,600kg, that could disable & destroy underwater targeta in a radius of 800 meters. The helicopter can stay airborne for 5.5 hours and cover a total distance of 1,100km. It beats any western made helicopter. Oil platforms, coastal areas, between the islands, fire-fighting and able to land on water. 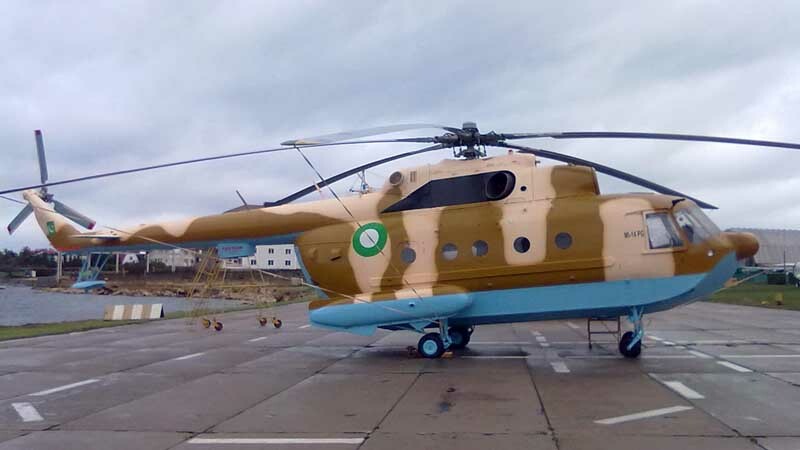 The Mi-14 PZH helicopter with two turboshaft engines TV3-117VM of 02 series or TV3-117VMA-CBM1V and with the main gearbox VR-14 is intended for operation in sea coastal areas, between islands (between a platform and a land) and in land areas. • for extinguishing of forest fires. Unlike widely known helicopters Mi-8, Mi-8MTV (Мi-17-1V) and Mi-8AMT (Мi-171), the bottom part of a fuselage of Mi-14 helicopter is executed in the form of a boat. The floats are inflated by a crew to facilitate the landing on a water-table as well as automatically from the pressure gauge behind the engine compressor in case of engine failure. • On an autorotation mode at refusal of two engines. 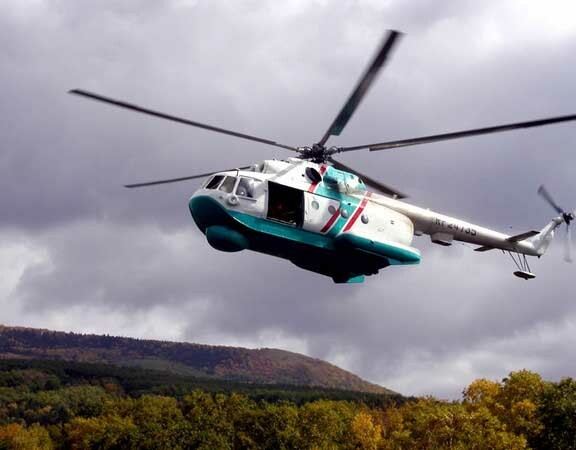 The Mi-14 helicopter is equipped with the system of emergency plum of fuel which is used in emergency cases if horizontal flight of the helicopter is not provided with one working engine, at refusal of other engine (reduction of flight weight due to fuel draining). The main aggregates of a power-plant, transmission and carrier system are unified with helicopters Mi-17, Mi-8MTV (Mi-17-1V and Mi-172) and Mi-8AMT (Мi-171) helicopters. 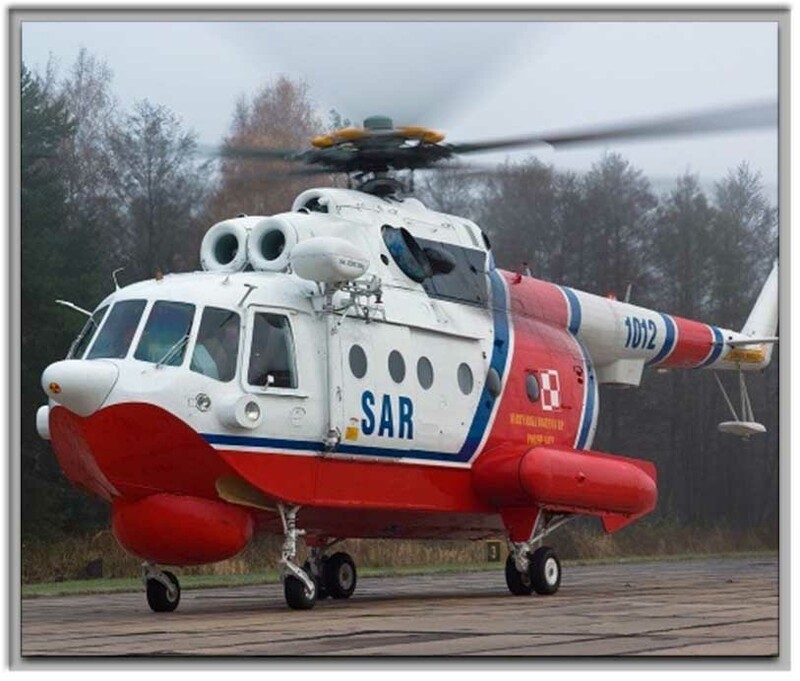 During modernization, Mi-14 PZH (fire-fighting version) helicopter will be equipped with TV3-117VM engines of 02 series or TV3-117VMA-SBM1V engines (with take-off capacity of 2500 horsepower each one, thus the specific expense of fuel – much more lower than on engines TV3-117-VM). During the installation of TV3-117VMA-SBM1V engines on the helicopter the start height will be – 6000 meters, working capacity of engines – up to 9000 meters (for comparison you can see the table No. 1). The APU Ai-9V is established on helicopters for starting engine operation at height. For loading of the helicopter with overall cargoes, the entrance door on the left board of a fuselage increases twice: 1.4 meters х 1.7. meters (there is a possibility of loading with europallet). The tail rotor blades with the increased chord are established on tail rotor for improvement of cross-section controllability at height. During the modernization of the helicopter the weight of the empty helicopter decreases by 800kg. The modern equipment is installed on helicopter in order it can fly at the international airlines. -G norm. = 13000 kg 3600m. -G max. = 14000kg 3100m. - G norm. = 13000kg 970km. - G max. = 14000кг 930km. Note: the basic flight operation characteristicswill change towards improvement at installation of engines TV3-117VM or ТV3-117VМА-CBМ1V. N.B. Complete law services via our NEW Thai Lawyer partner . (re: Alien Business Law: NEC Announcement 281 Cat A prohibited to foreigners). However under the terms of our Company License Asia Trading Post (Co Ltd) provide : 1. Cat 34 lawyer services &2. Cat 35.consultancy services.